I got my bike when I was living in Edmonton in 2010. I went to the Edmonton Bicycle Commuters’ Society (EBC), a great non-profit that sells and helps people fix up bikes. Someone had just donated a “Giant” brand mountain bike with an aluminum frame in good shape. My friend Adam helped me assess what was needed to fix it – pretty much just a new back wheel, some pedals, and a tune-up. After a bit of elbow grease and about $150 for the frame and the parts, it was ready for the road. I didn’t commute by bike in Edmonton, as I worked a fair bit outside of the city, but my house was just about perfect bike riding distance from the shops and bars on Whyte Avenue – a bit too far to walk regularly, but too close to justify driving or taking the bus. Although a mountain bike wasn’t necessarily my first choice, it was a good bike to have to ride the extensive trail system along the North Saskatchewan River valley. It was also a useful bike to have on some of the side streets, which were often in rough shape in my area of town. Despite a lack of bike lanes in Edmonton, especially on main roads in the core, there are lots of quiet residential streets to ride through to explore different neighbourhoods. Some people name their bikes, but I never did, mostly because mine was already branded a “Giant Boulder.” This seemed to me to be a suitably ironic and self-effacing name; it makes the bike sound like a big, heavy hard-to-ride lump, when in fact it was a perfectly speedy, functional machine. When I moved back to Toronto a couple of years ago, my bike came with me. Pretty soon I had a job that was a just-about-right 7 km, half-hour ride away from my home, from east to west through the core of the city. I’d usually take the Dundas East bike lanes, then head slightly northwest toward Harbord and Spadina. I often took Jarvis, before the city decided to tear out the bike lanes. 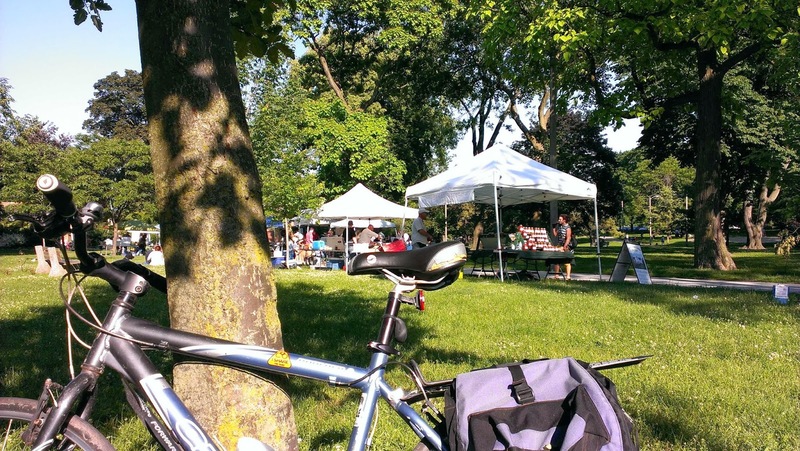 When the Sherbourne cycle tracks were finished, that was nice, but my favourite ride was cutting through the side streets of Cabbagetown, riding past the Victorian houses, sometimes stopping at Riverdale Farm or the Necropolis cemetery on my way home. This past summer, I ventured further than ever before on my bike on the weekends, taking regular rides with my friend Rich through the Don Valley, out to the Beaches, along the Leslie Spit, the Beltline, and out west to the Humber River. One weekend, I rode all the way from my house near Queen & Pape along the Waterfront Trail to my Dad’s house in Oakville. Riding my trusty Boulder, I took my love of bike riding to a new level. For most of this time, I kept my bike locked on my front porch. When my landlord had a new front porch built this summer, however, it made it more difficult to lock it there. Instead, I installed a metal loop to the fence behind my house, and locked my bike to that. I thought it was secure – but I was wrong. On a warm sunny Sunday in October, I was ready to take a good long bike ride along the Don Valley, and went behind my house to find the metal loop cut, and my bike gone. Although I’d thought about getting a new, fancier bike, it was only after my Boulder was gone that I really realized how much it meant to me. After riding it for so many kilometers, fixing it up and replacing parts (including a few visits to Bike Sauce), it became far more than just a possession or a means of transportation. I’m now thinking about fixing up a frame of a friend of mine, and it should be an excellent bike. But my Boulder changed my relationship with not just bicycles, but my city and how I relate to it. I miss it, and I will remember that bike always. I hope this story encourages others to hop on a bicycle for the first time, think about riding more often, or more importantly, appreciate their bike just a little bit more. Do you have a story to share about your bike, either past or present? What does your bike mean to you? 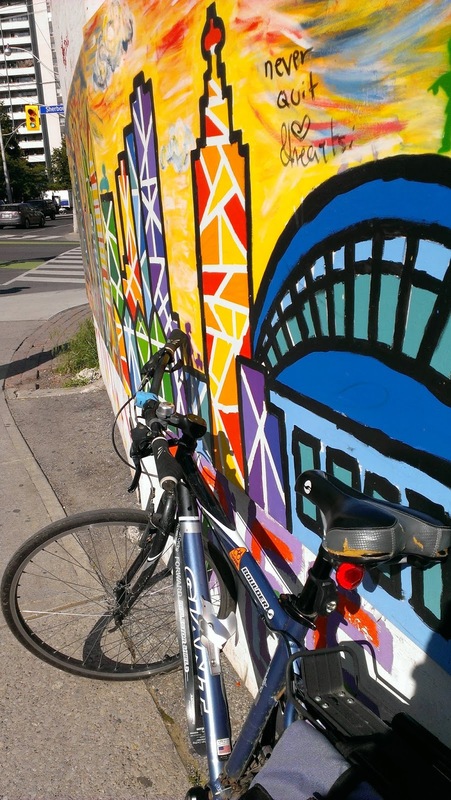 Send your story to ward_30@cycleto.ca or add a comment below. HELP FIGHT BIKE THEFT – Check, Register, Report. Before you buy a used bicycle, first check its serial number at isthisbikestolen.com. This will help ensure the bike you purchase is not stolen, and makes it harder for thieves to sell stolen bikes. Register your bicycle with Toronto Police. You can do this online at www.torontopolice.on.ca/bike. It will help ensure you can effectively report your bike stolen to police, even if you don’t remember the serial number. If your bike is stolen, report it to Toronto Police by calling (416) 808-2222 or online at www.torontopolice.on.ca. In the event your bike is found, police will return it to you. Recording your serial number and registering it with Police in advance will improve your chances of getting your bike back. Previous Post Jog-Downs at Temporary Entrances off Lake Shore into the Big Box Stores at Leslie Street are too Abrupt – Blinding Cyclists to approaching, turning cars.